Cameras and lenses dropped a bit in terms of the company’s total sales, from 74.4% to 68.3%. Nikon now forecasts that to continue dropping for the next three years, but still remain above half the company’s sales. More importantly, they forecast cameras and lenses to remain pretty much their sole profit center, providing from 84% to more than 100% of their profits in the coming few years. Cameras are important. The year-to-year comparison (2014 versus 2013) is mostly one of slight decline. 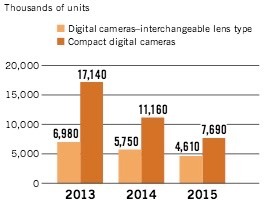 In particular, the report calls out the two primary businesses of Nikon: semiconductor equipment and cameras/lenses. In the CEO’s statement I note the following statement: “there is no reason to simply accept that the [camera] market is shrinking.” Curiously, though, Nikon says that they’ll focus their attempt to regrow cameras and lenses in 2017 (their fiscal 2018). These statements seem to be slightly in contradiction to one another. On the other hand, 2017 is Nikon’s 100th anniversary, so there’s the ceremonial aspect of targeting new growth starting their second century. As I’ve been saying for some time, it’s software that makes tech products. Note the following statement in the report: “the origins of ideas still tend to be biased towards hardware. …a strengthening of software aspects…is now being pursued.” Okay, but strengthening a weak entity is easy. Making it core to the products being produced is a whole ‘nother thing. One thing that’s interesting to me is the following chart. Note that while net sales has been quite variable in the Imaging group, the profit has been less so. I believe that Imaging has been driven to hit profit targets more than anything else, and it shows in QA/QC, support, advertising, and other auxiliary things. Indeed, on a percentage basis, Imaging is now more profitable than it’s ever been relative to sales, but I believe that’s coming at a high cost to customers. The problem for Nikon Imaging is clearly seen in the following chart: declining volume. One of two (or both) things have to happen for Imaging to continue driving the company: (a) reverse the unit decline; and/or (b) increase the unit price of the goods sold. So how does Nikon Imaging intend to do that? It’s a bit unclear. Nikon already pushed the sales ratio of medium and high-end class DSLRs upward (the (b) in the previous bullet). How much further they can do so is questionable. Indeed, far less information about the situation of Imaging and how it will evolve was present in this year’s annual report than last, and less than the other groups within Nikon presented. I take that to mean that the Imaging group doesn’t yet have a truly comprehensive plan to move forward in cameras and lenses and is still in an iterative mode. “I am not satisfied with the current situation for our Nikon 1 cameras.” The proposed solution is new models, but that hasn’t exactly been the problem with the Nikon 1’s position in the market. Price has really been the thing that has held back the Nikon 1, along with lens selection. Couple that with some poor decisions on features and UI, and you can explain why the Nikon 1 isn’t doing well. But really, lower the price and introduce the right lenses. I don’t see either of those things mentioned in the annual report. A new philosophy has appeared as the top level statement: “trustworthiness and creativity.” A lot of Nikon customers might have some issues with Nikon’s statement that those are their unchanging principles to which they will always be dedicated. A lot of DSLR users are feeling that they can’t trust Nikon’s latest products (ship with defects) and that they’re mostly iterative and not particularly creative when they do appear. Nikon also states that they want to exceed expectations of their customers. I’m not sure about you, but my expectations aren’t being exceeded, though they are often met. Who owns Nikon? You keep hearing that it’s a subsidiary of Mitsubishi from those that haven’t been paying attention. It isn’t. It’s a publicly held company. But almost a third of the stock is held by various Japanese banks and bank-like entities. In one aspect this is good news, as the banks have clearly forced Nikon to think about cash flow, assets, equity, and yes, dividends. Nikon seems tightly managed to fiscal expectations, and less so customer expectations. That’s one of the reasons why they’ve been able to maintain a profitable situation with their two primary businesses both in decline or crisis: they manage money first and foremost.